Is compressive load a factor in the development of tendinopathy? Tendons are designed to take tensile load, but excessive load can cause overuse tendinopathy. Overuse tendinopathy results in extensive changes to the cells and extracellular matrix, resulting in activated cells, increase in large proteoglycans and a breakdown of the collagen structure. Within these pathological changes, there are areas of fibrocartilaginous metaplasia, and mechanotransduction models suggest that this response could be due to compressive load. As load management is a cornerstone of treating overuse tendinopathy, defining the effect of tensile and compressive loads is important in optimising the clinical management of tendinopathy. This paper examines the potential role of compressive loads in the onset and perpetuation of tendinopathy, and reviews the anatomical, epidemiological and clinical evidence that supports consideration of compressive loads in overuse tendinopathy. Excess training volume or too much training that uses the elastic function of tendons are the key elements that induce tendon overload and are important factors in the onset of athletic tendinopathy, the clinical syndrome of pain and dysfunction in a tendon. Tendons have evolved primarily to transmit tensile load and have a fibrous tissue structure that accommodates this, hence it is traditionally thought that the nature of the overload is purely tensile. However, some recent papers have provided evidence for compressive load at or near regions where tendinopathy occurs. This concept requires further examination as better insight into the pathoaetiology of tendinopathy and the loads that initiate pathology may improve treatment in this common, recurrent and difficult to manage condition. Almekinders et al1 were the first to consider compression, or a differential in tensile loads, as a concept for overload of tendons. They suggested that strains at the Achilles tendon insertion were not uniform and proposed that the joint side of the tendon was exposed to less tensile load (stress shielded) and may be subjected to compressive loads.2 This somewhat complex model of differential strains in a tendon has withstood some scrutiny, but the clinical applications have been limited. Further consideration of aspects of compression in common presentations of tendinopathy and their relation to a clinical paradigm is required. What is the evidence that compression affects tendon? 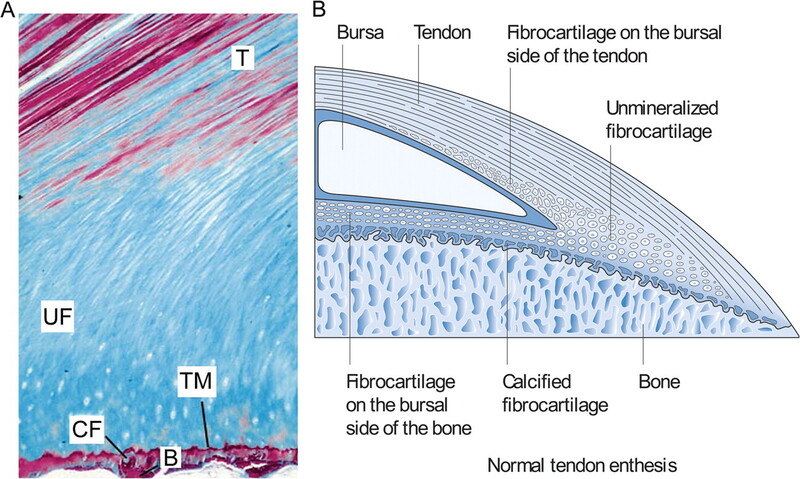 Collagen-based connective tissue (fibrous, fibrocartilage, cartilage and bone) can respond to different types of loads by altering their tissue structure to be suitable for applied loads.3 Gillard et al4 demonstrated this in uninjured rabbit tendons when they first removed and then reinstituted compressive loads, resulting in tissue change from fibrous tissue towards fibrocartilage at the point of compression, with a return of fibrous tissue on removal of compression. These adaptive responses are driven by tendon cells, which respond to cyclic compression by becoming more rounded (chondrocytic) and by expressing large proteoglycans such as aggrecan.7 8 Many authors have reported an increase in the deposition of aggrecan and type II collagen in the areas of compression within tendons,6 notably on the deep surface of tendons adjacent to a bony prominence. Biomechanical modelling9 and in vitro cell cultures subjected to mechanical stimuli10 strongly implicate hydrostatic pressure as the stimulus for this response. These changes are also described at the deep surfaces of most entheses where compression is a feature. What is the relationship between tissue adaptation to compression and tendinopathy? These changes with pathology are similar to those in the fibrocartilage (fibrocartilaginous metaplasia),13–14 and this is a universal response regardless of the site.15 Mechanotransduction models16 would suggest that this is a result of some form of compressive load being placed on the tendon, as compressive loading in soft connective tissues tends to favour fibrocartilage formation.17 There are, however, some differences between tendon pathology and fibrocartilage (table 1). Compressive loads have been shown to induce tendon pathology. Soslowsky et al18 investigated the effect of different loads on rat supraspinatus tendon and examined the effect of compressive load, tensile load and the combination of compressive and tensile load.19 They showed that compressive load (by interposing tissue between the tendon and acromion) in itself had minimal effect in the tendon, tensile load (running downhill) was clearly detrimental, but the combination of loads was especially damaging to the tendon. Increased cross-sectional area and decreased mechanical properties were maximal in tendons exposed to both compressive and tensile loads. Are there compressive loads where tendon pathology occurs? In examining the loads on the enthesis organ, especially proximal to the insertion, these areas of the tendon are nearly always exposed to both tensile and compressive loads, especially in some joint positions, suggesting that this may predispose to pathology at the bony prominence before insertion. Although this paper discusses compression, it is important to acknowledge that the load in the tendon near an enthesis will vary through its thickness and length and essentially be a combination of tensile and compressive loads rather than solely compressive load. For simplicity, we will continue to discuss it as ‘compression’. Importantly, many clinical presentations of tendinopathy at the bone–tendon junction occur at, or adjacent to, the area of compression of the tendon against the bone proximal to the insertion, not at the actual insertion of the tendon to the bone. Abnormal clinical and imaging findings are seen at the site of compression proximal to the tendon insertion,22 23 and strongly suggest that compression where bone and tendon approximate are important considerations in the onset of tendinopathy. Pathology prior to the insertion fits a number of problematic tendons, and the compression may be immediately proximal to, or more removed from, the insertion (table 2). Some tendons have a fixed bony prominence proximal to the insertion, others have a prominence that is modified by movement and effective in some joint positions, while others still have a movement modified prominence that is external to the bone–tendon muscle continuum and is prominently dependent on movement of other joints. Despite the concept offering insight into many clinical presentations, there are several tendons that lack a bony prominence and compression is unlikely to have an important role in the onset of tendinopathy. These include the flexor tendons of the forearm that insert into the medial epicondyle of the humerus and the insertion of the patellar tendon into the patella. The lateral elbow enthesis is discussed below as it has a bony prominence only in some forearm positions. How does this relate to tendinopathy? Regions of tendons that anatomically abut a bony prominence such as the tibialis posterior at the medial malleolus have been examined to better understand the fibrocartilaginous metaplasia within these regions that occurs adjacent to the bone.9 24 Wren et al25 used a poroelastic model to propose that zones of compression have low-fluid permeability because of the strong water binding properties of aggrecan, which in effect restricts fluid flow and serves to protect the solid components within the matrix, presumably the cells and collagen. Conversely, they propose the tensile regions have a feature of higher fluid permeability, and are less well suited to high cyclic compression loads. Between the compressive (fibrocartilage adjacent to the bone) and tensile (fibrous tissue in the region removed from the bone) zones of the tendon that abut a bone is a transition zone with graduated features of both. This gradation from compressive to tensile morphology occurs from the deep to the superficial aspects of the tendon. Along the deep aspect of the tendon, this transition occurs proximally, and in some cases distally. It is possible that the transition zone is affected in the development of tendinopathy in the following manner. Excessive loading has the propensity to partially deplete the bound water normally present in the tensile and transitional zones. This movement of water has been postulated by Grigg et al26 who reported a loss in tendon diameter in the tensile zone of the Achilles mid-tendon when the tendon was subjected to repeated eccentric load. Some validation for the transition zone as being the area affected is provided by Scott et al28 who induced supraspinatus tendinopathy in the rat. The authors described the typical features of tendinopathy (cell rounding, aggrecan deposition) extending beyond the normal fibrocartilaginous zone of insertion, both proximally and superficially into regions normally occupied by normal spindle shaped tenocytes. How does this concept help clinically? Stretching might be provocative in these entheseal tendinopathies where there is some tension in the muscle as well, such as stretching the Achilles insertion over the edge of a step. Overall, it is probably better to manage muscle compliance and length with massage techniques rather than stretching in tendinopathy that has a compressive element. The lateral elbow also suffers mostly from a true enthesopathy, however the enthesis organ is more complex. The enthesis has a variable bony prominence in the radial head, which appears to act as a bony prominence in forearm pronation and mid-prone, but not in supination (figure 2). This may be an anatomical adaptation, as maximal extensor muscle loads generally occur in the pronated position. In this position, the tendon will be compressed against the radial head to reduce load on the insertion. However, in supination there is no protection for the enthesis of the extensor muscles from such a prominence. This is functional, as the main muscle loads in supination are usually placed on the flexors (as in picking up objects with palm up). However, large extensor muscles load in supination, such as gripping with repeated pronation and supination, places a direct load on the enthesis. This is seen clinically when lateral elbow tendinopathy presents after repeated pronation and supination such as heavy use of a screwdriver or wringing out clothes. The radial head in pronation (A) and supination (B) providing some protection of the insertion in pronation but not supination. ET, extensor tendon, RH, radial head. What about the Achilles mid-tendon? There is potential for some compressive loads even in the mid-tendon, Almekinders et al1 discuss internal shear due to differential forces on the posterior and anterior aspects of the tendon. An additional internal tendon shear force may come from the differential contribution of the gastrocnemius and soleus fibres to the Achilles tendon.40 41 Recent publications suggest that the plantaris tendon may also apply a compressive force in some athletes, where the plantaris tendon is invaginated into the Achilles (figure 3).42 As the plantaris tendon is stiffer,43 it is suggested that it places a shearing or compressive load on the Achilles especially, in dorsiflexion/eversion, creating tendinopathy in either or both the Achilles and the plantaris. This subset of Achilles tendinopathy may explain why raising the height of the heel in the shoe can have such a variable effect on mid-Achilles pain, perhaps being very helpful in those with an invaginated plantaris tendon and less so (or not at all) for those who solely have a mid-Achilles tendinopathy. 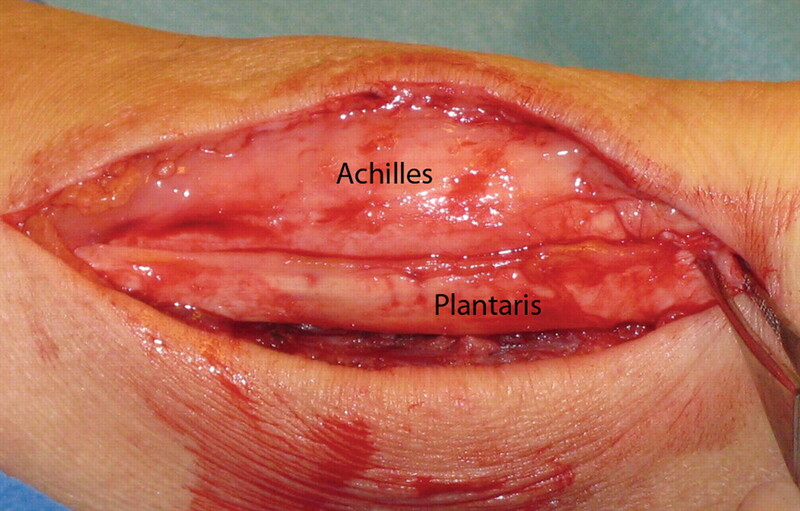 The relationship between the Achilles and plantaris tendon. How does this concept help clinical understanding? The tendon insertion and the enthesis organ are well engineered to absorb most functional loads, and will adapt over time to higher levels of load. However, these tissues are slow to adapt to high loads and slow to resolve after insult. Overload may trigger a tendinopathic response and mere abolition of the overload in the short term is usually insufficient to resolve the tendinopathy and return the athlete to full function. Load management in tendinopathy has primarily relied on reducing the volume and/or intensity of the training load, as well as amendment of any aberrant biomechanical issues. Reducing compressive loads in insertional tendinopathies provides an important further unloading strategy for the sensitised tendon (table 3). Reduction of compressive loads is often simple, such as changing training strategies, reducing stretching or adding a heel raise, and an athlete with minimal pain may continue some training loads with these interventions. The pathoaetiology of tendinopathy is still not well understood, and many models have been proposed. Some of these models propose that tensile overload tears collagen that results in tendon pathology.54 55 If compressive loads have an important role in the development of tendinopathy then these models are left lacking, and models that propose a cell-led response to load appear more robust.56 This may be especially true of the insertional tendinopathies, where combinations of tensile and compressive loads exist. Compressive overload may also explain the resistant nature of these tendinopathies. As the matrix changes and the tendons swell, the compression is higher and likely to occur earlier in joint range, making the condition progressive. The deposition of aggrecan (and its breakdown products)11 and this association with a decreased permeability of the matrix may also explain the slow resolution. In essence, the perpetuation of swelling in tendinopathy may in itself create a space-occupying lesion, further increasing the internal compression stimulus on the matrix. The changes in the tendon collagen should also be considered, as tendinopathy is widely reported to increase the amount of type III collagen deposited in the matrix. An interesting corollary to this hypothesis of compression is that although type II collagen has been identified in the normally appearing fibrocartilage subjected to compressive loads in the enthesis it has been reported only occasionally in tendinopathy.57 Further investigation of this collagen type is required as it relates to cell lineage, mechanotransduction elements, load parameters and attendant cytokines. Although the science is incomplete in substantiating a role for compression in the typical tendinopathies encountered in clinical practice, we have endeavoured to provide a cellular, biomechanical and clinical level for such a hypothesis to improve understanding and management of tendinopathy. Further research of the effects of provocative loading on the enthesis would be valuable. This needs to be complemented with clinical trials that examine the effect of reducing compression in the management of tendinopathy. Consideration of entheseal or external compression within the pathoaetiological and management paradigm may improve understanding and management of tendinopathy. This review was supported by the Australian centre for research into sports injury and its prevention, one of the International Research Centres for Prevention of Injury and Protection of Athlete Health supported by the International Olympic Committee.
. Compression etiology in tendinopathy. Clin Sports Med 2003;22:703–10.
. Strain behavior of the distal achilles tendon: implications for insertional achilles tendinopathy. Am J Sports Med 2004;32:457–61.
. Compressive compared with tensile loading of medial collateral ligament scar in vitro uniquely influences mRNA levels for aggrecan, collagen type II, and collagenase. J Orthop Res 2000;18:524–31.
. The influence of mechanical forces on the glycosaminoglycan content of the rabbit flexor digitorum profundus tendon. Connect Tissue Res 1979;7:37–46.
. Three-dimensional reconstructions of the Achilles tendon insertion in man. J Anat 2002;200:145–52.
. Fibrocartilage in tendons and ligaments–an adaptation to compressive load. J Anat 1998;193 (Pt 4):481–94.
. Effect of stress deprivation and cyclic tensile loading on the material and morphologic properties of canine flexor digitorum profundus tendon: an in vitro study. J Orthop Res 1995;13:907–14.
. Changes in the composition of the extracellular matrix in patellar tendinopathy. Matrix Biol 2009;28:230–6.
. Cellular shape and pressure may mediate mechanical control of tissue composition in tendons. J Orthop Res 1993;11:581–91.
. Influence of cyclic hydrostatic pressure on fibrocartilaginous metaplasia of achilles tendon fibroblasts. Biomech Model Mechanobiol 2006;5:247–52.
. Change in proteoglycan metabolism is a characteristic of human patellar tendinopathy. Arthritis Rheum 2010;62:3028–35.
. Histopathology of common tendinopathies. Update and implications for clinical management. Sports Med 1999;27:393–408.
. Histopathological findings in chronic tendon disorders. Scand J Med Sci Sports 1997;7:86–95.
. Morpho-functional changes in human tendon tissue. Eur J Histochem 2002;46:3–12.
. Similar histopathological picture in males with Achilles and patellar tendinopathy. Med Sci Sports Exerc 2004;36:1470–5.
. Tissue adaptation to mechanical forces in healthy, injured and aging tissues. Scand J Med Sci Sports 2005;15:199–201.
. Tension and compression as basic determinants of cell form and function: utilization of a cellular tensegrity mechanism. Cell Shape: Determinants, Regulation, and Regulatory Role. San Diego, CA: Academic Press. 1989:3–32.
. Neer Award 1999. Overuse activity injures the supraspinatus tendon in an animal model: a histologic and biomechanical study. J Shoulder Elbow Surg 2000;9:79–84.
. Rotator cuff tendinosis in an animal model: role of extrinsic and overuse factors. Ann Biomed Eng 2002;30:1057–63.
. Functional and developmental anatomy of tendons and ligaments. In: Gordon SL, Blair SJ, Fine LJ, eds. Repetitive Motion Disorders of the Upper Extremity. American Academy of Surgeons, Park Ridge, IL: 1995:185–203.
. The “enthesis organ” concept: why enthesopathies may not present as focal insertional disorders. Arthritis Rheum 2004;50:3306–13.
. Sclerosing therapy in chronic Achilles tendon insertional pain-results of a pilot study. Knee Surg Sports Traumatol Arthrosc 2003;11:339–43.
. MRI and US of gluteal tendinopathy in greater trochanteric pain syndrome. Eur Radiol 2007;17:1772–83.
. Tendon and ligament adaptation to exercise, immobilization, and remobilization. J Rehabil Res Dev 2000;37:217–24.
. Mechanobiology of tendon adaptation to compressive loading through fibrocartilaginous metaplasia. J Rehabil Res Dev 2000;37:135–43.
. Eccentric calf muscle exercise produces a greater acute reduction in Achilles tendon thickness than concentric exercise. Br J Sports Med 2009;43:280–3.
. Patellar tendinosis as an adaptive process: a new hypothesis. Br J Sports Med 2004;38:758–61.
. Achilles tendon disorders in athletes. Am J Sports Med 2002;30:287–305.
. Musculoskeletal disorders that frequently mimic radiculopathy. Phys Med Rehabil Clin N Am 2002;13:469–85.
. Proximal hamstring tendinopathy: results of surgical management and histopathologic findings. Am J Sports Med 2009;37:727–34.
. Greater trochanteric pain syndrome: ultrasound, surgery and histology evaluation. Clin Ortho Rel Res 2010;468(7):1838–44.
. Athletic pubalgia: recognition, treatment, and prevention. Ath Train Sports Health Care 2010;2(1).
. Differentiation of Greater Trochanteric Pain Syndrome and Hip Osteoarthritis. 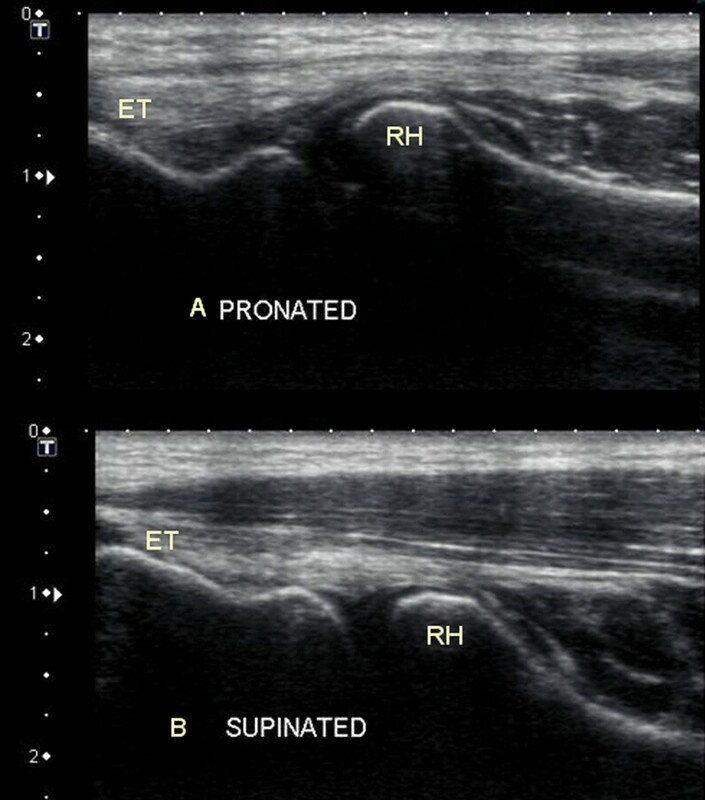 Canberra: Australian National University 2011:93.
. Stress-shielding as a cause of insertional tendinopathy: the operative technique of limited adductor tenotomy supports this theory. J Sci Med Sport 2004;7:424–8.
. Arthroscopic surgery for patellar tendinitis: a new technique. Arthroscopy. 1998;14 (Suppl 1):S44:.
. Painful conditions in the Achilles tendon region in elite badminton players. Am J Sports Med 2002;30:51–4.
. Sports injuries surveillance during the 2007 IAAF World Athletics Championships. Clin J Sport Med 2009;19:26–32.
. Surgical repair of ruptured Achilles tendon in sportsmen and sedentary patients: a longitudinal ultrasound assessment. Int J Sports Med 1990;11:78–84.
. Differential displacement of the human soleus and medial gastrocnemius aponeuroses during isometric plantar flexor contractions in vivo. J Appl Physiol 2004;97:1908–14.
. Fascicles of the adult human Achilles tendon - an anatomical study. Ann Anat 2009;191:586–93.
. Where to now with Achilles tendon treatment? Br J Sports Med 2011;45:386.
. The role of Plantaris Longus in Achilles tendinopathy: a biomechanical study. Foot Ankle Surg 2010;17:252–5.
. De Quervain's disease. Changing pathology or changing perception? J Hand Surg Br 2000;25:65–9.
. Management and referral for trigger finger/thumb. BMJ 2005;331:30–3.
. Eccentric calf muscle training in non-athletic patients with Achilles tendinopathy. J Sci Med Sport 2007;10:52–8.
. A 12-month prospective cohort study of injury in international rowers. Br J Sports Med 2010;44:207–14.
. Effects of 20 days of bed rest on the viscoelastic properties of tendon structures in lower limb muscles. Br J Sports Med 2004;38:324–30.
. Stress deprivation simultaneously induces over-expression of interleukin-1beta, tumor necrosis factor-alpha, and transforming growth factor-beta in fibroblasts and mechanical deterioration of the tissue in the patellar tendon. J Biomech 2005;38:791–8.
. New regimen for eccentric calf muscle training in patients with chronic insertional Achilles tendinopathy: results of a pilot-study. Br J Sports Med 2008;42:746–9.
. Painful conditions in the Achilles tendon region: a common problem in middle-aged competitive badminton players. Knee Surg Sports Traumatol Arthrosc 2002;10:57–60.
. Strain patterns in the patellar tendon and the implications for patellar tendinopathy. Knee Surg Sports Traumatol Arthrosc 2002;10:2–5.
. Mechanical Loading and TGF B1 regulate proteoglycan synthesis in tendon. Arch Biochem Biophys 1997;342(2):203–11.
. Pathogenesis of tendinopathies: inflammation or degeneration? Arthritis Res Ther 2009;11:235.
. Deciphering the pathogenesis of tendinopathy: a three-stages process. Sports Med Arthrosc Rehabil Ther Technol 2010;2:30.
. Is tendon pathology a continuum? A pathology model to explain the clinical presentation of load-induced tendinopathy. Br J Sports Med 2009;43:409–16.
. Fibrous cartilage in the rotator cuff: A pathogenetic mechanism of tendon tear? J Shoulder Elbow Surg 2004;13:328–32.
. Tendons in health and disease. Man Ther 1996;1:186–91.